The city of Snoqualmie has started construction of a roundabout located near Snoqualmie Falls. The Snoqualmie Indian Tribe says that land is sacred. The Snoqualmie Indian Tribe says Snoqualmie Falls is the birthplace of its people, a sacred spot where the mists carry prayers to ancestors. Tribal members believe the site is spiritually significant not only to Northwest Indians, but to all people. As the city of Snoqualmie begins construction of the nearby Tokul Road roundabout, Snoqualmie tribal members say they want to continue protecting the falls, and the surrounding land, from further desecration. 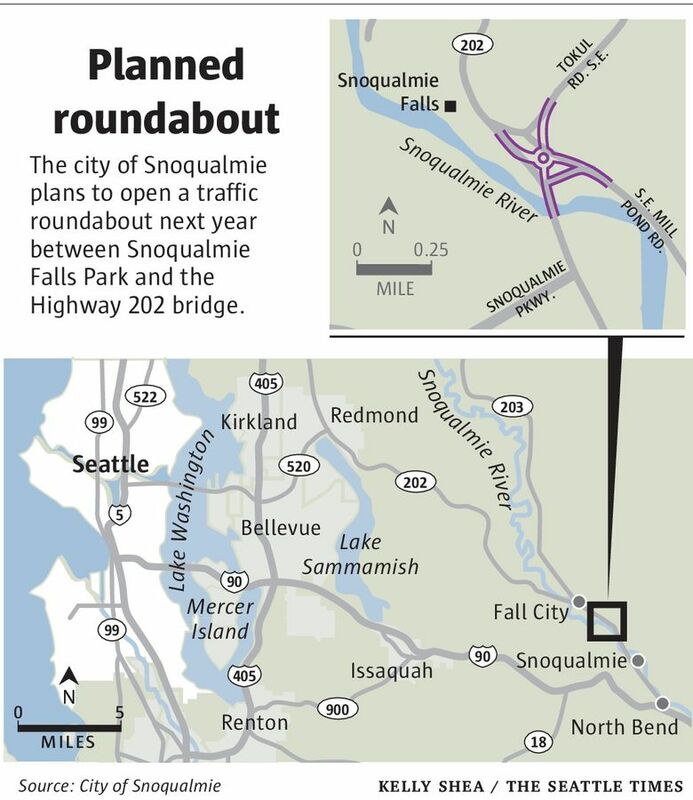 The city says the roundabout between Snoqualmie Falls Park and the Highway 202 bridge will make the roads safer for millions of visitors. The 500-member tribe says their ancestors were buried there, and the site should be left alone. The recent discovery of a prehistoric artifact supports their beliefs, the tribe says. The projectile point, which an independent archaeologist estimated to be 4,000 to 9,000 years old, was returned to the tribe last week. Archaeologists concluded the artifact was an “isolated find,” city officials said in a statement, and did not warrant stopping construction, which began in July. The project, scheduled to be complete in May 2016, will include a new storm-drainage system, signs and roadway paving, according to the city. The roundabout, which slows traffic, will improve safety for the nearly 2 million people who visit Snoqualmie Falls each year. According to the city, the two intersections that will be eliminated do not meet current safety standards. Plans for the project date back a decade. In 2007 the Muckleshoot Indian Tribe bought the nearby Salish Lodge and Spa, having outbid groups including the Snoqualmie Tribe. The Muckleshoot Tribe is helping fund the roundabout. According to project documents, the roundabout could be the “gateway” feature welcoming visitors to the city. It is being designed in anticipation of further development nearby. City officials said in a statement Wednesday that the ad was the first time they heard from the tribe about the belief that the area is sacred. The tribe has long opposed development at and around the falls, where a hydroelectric generating plant was built in 1898. In 2005, Puget Sound Energy was ordered to decrease the amount of water diverted to its two hydroelectric plants each May and June after a legal battle with the tribe. The tribe attempted to decommission the plants in 2008, but the 9th U.S. Circuit Court of Appeals denied the petition for further review of the plants’ operating license. “We still need places that we can go and be in awe of how majestic things were,” said Snoqualmie Chairwoman Carolyn Lubenau. 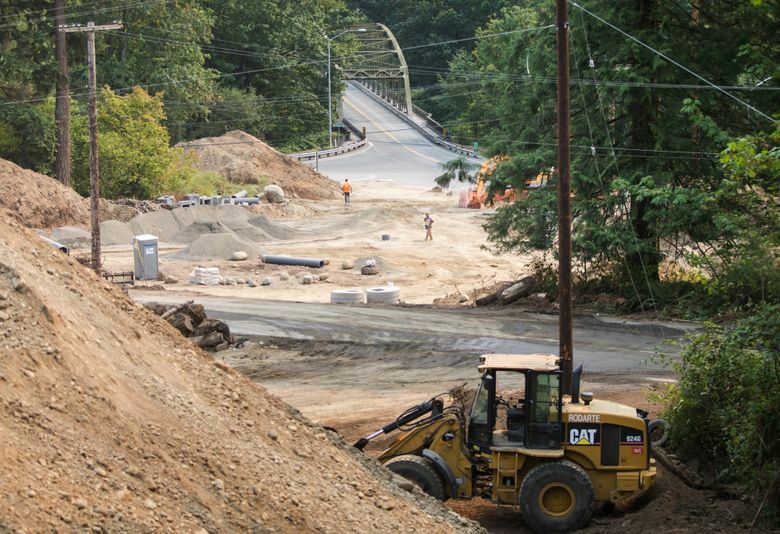 When construction was set to begin in 2012, the tribe asked the Army Corps of Engineers to suspend the city’s permit pending additional consultation. In January, the corps and the federal Advisory Council on Historic Preservation entered into an agreement with the city, which called for the city to hold public meetings with the tribe and spend funds for outreach and projects related to the cultural heritage of the area. Still, the corps released the city’s permit, which allowed roundabout construction to begin. In March, Lubenau testified before the U.S. House Appropriations Subcommittee on Interior and Related Agencies that the development plans threatened the tribe’s “use of the falls for cultural and spiritual needs and are deeply disrespectful of the sacred falls that form the very core of who we are as a people.” She asked that committee members partner with the tribe in preserving the falls and the area around the falls by helping them halt roundabout construction. “We will do everything in our power to fight this development and protect our sacred Snoqualmie Falls,” she testified.